While Tamilnadu is slowly recovering from an exasperating hot weather condition, a farrago of Thunderstorms here and there under heat convection in the interior Tamilnadu districts might continue for next few days too. But most importantly, an upper air cyclonic circulation is likely to develop over South East Bay of Bengal & neighbourhood during next 24 hours. This one has to be watched for, as various weather models are projecting it to develop into a Low pressure area. With the development of this upper air cyclonic circulation, conditions are likely to become favorable for further advance of southwest monsoon into some more parts of southwest, southeast and eastcentral Bay of Bengal during subsequent 2-3 days. Currently the Northern Limit of Monsoon (NLM) continues to pass through Lat.5.0°N/Long. 80.0°E, Lat.8.0°N/Long. 87.0°E, Lat.13.0 °N/ Long. 92.0° E and Lat. 16.0° N/ Long. 95.0° E. Meanwhile Thunderstorm accompanied with squall and hail very likely at isolated places over Jammu & Kashmir, Himachal pradesh, Uttarakhand, Punjab, Haryana, Chandigarh & Delhi, Rajasthan and West Uttar Pradesh. Thunderstorm accompanied with gusty winds very likely at isolated places over East Uttar Pradesh, northwest Madhya Pradesh, interior Odisha, South Interior Karnataka, Kerala and Andaman & Nicobar Islands. 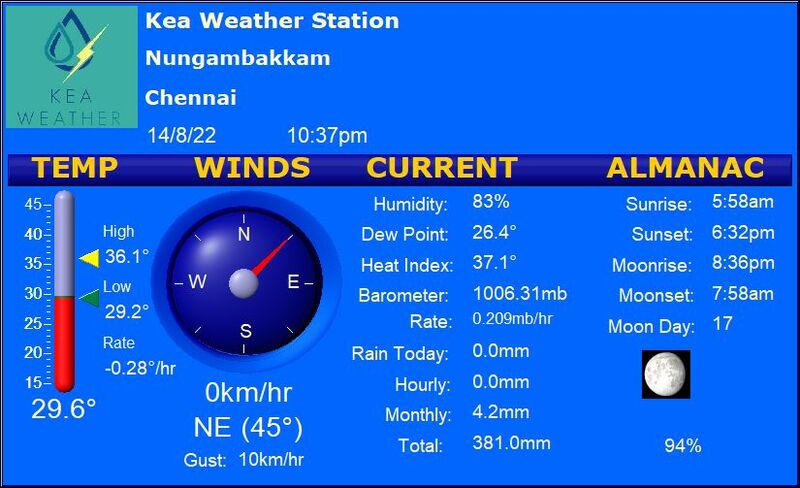 Chennai – A partially cloudy sky with an expected maximum of around 39 degrees and a minimum of 30 degrees. Coimbatore – Mostly cloudy sky with a high of 35 degrees and a low of 25 degrees. Thunderstorms are expected in the district. Madurai – Partly cloudy sky with a Maximum of 40 degrees and a minimum of 27 degrees. Tiruchi – A partly cloudy day with a High of 39 degrees and a low of 27 degrees. Vellore – A hot day on cards with a Maximum of 41 degrees and a minimum of 26 degrees. Thunderstorms are expected in the region.